​The World Pilot Gig Championships are held every year on the first spring bank holiday in May. It’s a great weekend to come and experience gig rowing on an immense scale, for rowers and spectators alike. From humble beginnings in 1990 with less than 20 gigs participating, this wonderful spectacle has grown year on year and there are now more than 150 gigs participating over the weekend. St. Martins is the ideal place to stay for the World Pilot Gig Championships as you will be able to be part of all the excitement of the rowing events based on St. Marys, combined with all that's on offer on this very special island, by enjoying the wonderful beaches and walks when all the rowing is over. 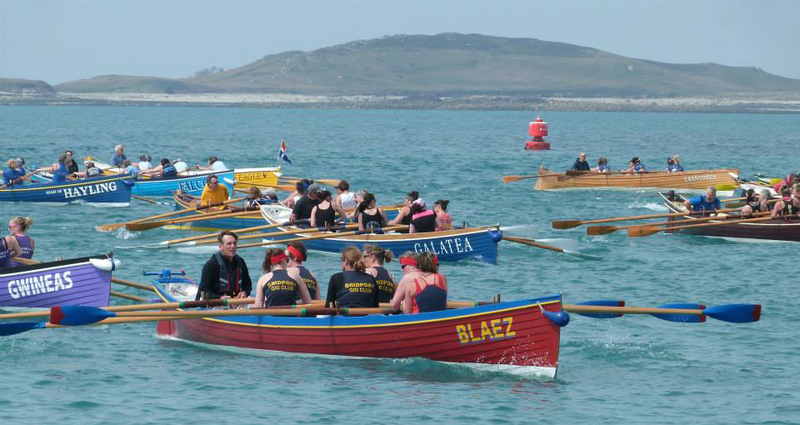 This year the St. Martin's gig crew will be competing in Galatea so please come along and give us a cheer! We'll be the rather scruffy looking chaps in a dark blue boat. Tresco Boats run a good schedule of boats to St. Mary's throughout the weekend. Once on St Marys, catch a boat from the harbour to St Martin’s. You’ll need to claim your luggage from the airport & travel with it down to the harbour. If you come by sea your bags will be transferred directly from the Scillonian to the awaiting boat for St Martin’s and you will be re-united with it when you arrive on St Martin’s. Labels will be available when you check your luggage in on Penzance Quay, please attach the relevant coloured ‘off Island’ label from Penzance, Red for St Martin’s. Gig clubs will be required to book the transport of their gig with the Isles of Scilly Steamship Company by calling their freight office in Penzance on 01736 334220 and the lovely Debbie will be able to help you. Previous years have seen a discount given to club rowers going to participate in the races travelling on the Scillonian. Once your gigs and paddles are on St Mary’s they will stay there for the whole weekend. There’s camping and b’n’bs, chalets and cottages, we’ve even got a hotel! You can find lots of information on our ‘places to stay’ page. It is best to contact the accommodation providers directly as we don’t list their availability. ​Lots on offer from good pub grub, fish and chips, a bakery to finer dining if you wish. The Seven Stones Inn will be serving dinner until 9.30pm on the Friday and Saturday evenings, and for the Sunday evening a celebratory outside (weather permitting) BBQ and music; if you have the energy for a boogie. To get your Saturday and Sunday started right, book for a breakfast of champions at the pub or munch on an Island Bakery bacon buttie while boating over to St Mary’s. There are lots of places to eat when you are on St Mary’s, with the main food tent next to the beach where you leave your gigs. It offers fab rowers tucker. Also on St Mary’s quay the RNLI offer a good range of hot and cold snacks for the spectators too, it’s a great spot to cheer the gigs over the finish line. St. Martin’s Gig Club Chairman, Barney McLachlan, will be happy to help with any rowing related queries.